Today I almost blew up the house! The day started like any other normal day but then everything went very wrong. As usual, I went downstairs to have breakfast. While I was eating, I noticed that there are three coconuts in the fruit bowl. Why so many coconuts, you ask… A perfectly good question. It’s because I love the taste of a good coconut smoothie in the morning (and in the afternoon, and in the evening). So I tend to stock up on my supply of fresh coconuts at least once a week. I try to avoid the tinned coconuts as they have a chemical taste and are not as healthy as the fresh stuff. The disadvantage of buying fresh coconuts, is that you can’t just put them in the blender. You have to smash them with a hammer of sharp object and then you have to cut the white coconut flesh out. It’s both work and fun! As you can imagine, the smashing is more fun than the cutting. Once you have the coconut pieces cut out, it’s best to put them in the blender right away because it’s easier to store. Another fun fact about coconuts is that even when you cut it into pieces it’s still quite a tough fruit. It’s not like when you cut a banana and the pieces are all soft. How I know this? Well, as I noticed the three coconuts in the bowl I immediately smashed them, cut them up and put them in the blender. Soon after turning on the blender, I started to hear some strange noises. Not the kind of noises you want to hear from your blender at all! To make things worse, soon after the first noises, black smoke started to emerge from the blender. I wanted to turn the blender off but when I touched it, it was so hot that I had to let go again immediately. The kitchen started to fill up with black smoke very fast and visibility was decreasing by the minute! Words like “Hiroshima” or “Manhattan Project” came to mind as I was thinking about the imminent explosion! In a last heroic effort to save my host family I grabbed the blender even though it was still quite hot, ripped the cable out of the socket and ran for the back door as fast as I could. As I pulled open the door, I noticed Casper. He was looking at me with his beady little dog eyes. So in one smart move, I threw the hot smoking blender into the garden. Then I grabbed Casper and ran back inside and closed the door on the diabolical machine. I put Casper down, put my fingers in my ears and counted to 20. But there was no explosion. What a relief! 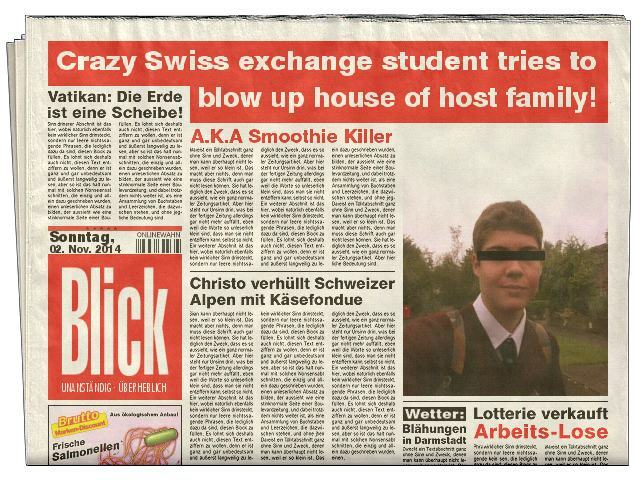 Surely, this would have made the local headlines: “Crazy Swiss exchange student tries to blow up house of host family!” Casper must have sensed that something is very wrong as he runs around the kitchen and barks at me. Just as I’m thinking about how the blast would have ripped “Monstro” to pieces, Margaret enters the kitchen. Naturally, she’s a bit surprised about all the black smoke in the kitchen and ask for an explanation. As I tell her that I have just almost blown up her house she reacts in an unusual way: She laughs, and laughs and laughs… Casper is confused about her laughing too. He must think that I did something wrong so he runs over to me and grabs my left foot with his teeth. Ouch! We opened the windows to let the smoke out and soon everything was back to normal. Except that now everyone calls me the “Smoothie Killer” and the other problem is that we no longer have a functioning blender. So I went to an electronics store nearby called “Power City” and bought a new and improved blender. I don’t know if it’s coconut-certified but at least it has a two-year guarantee. So if another “incident” should occur, I can just bring the broken blender back to the store and have it replaced. Back home, I immediately had to test the new blender. Blowing up the old blender wasn’t such a bad decision since the new one has a couple of nifty features that the old one didn’t have. For example, you can control the speed of the blades and it also has bigger jar. I can now make bigger and even better smoothies! Tomorrow, the mid-term break is over and I have to go back to school. Funny how time flies when your’re having fun or when you’re blowing up household devices….